Yoga CAS (#vajrayoga) is an integral system of work with the body and mind. It includes philosophy, psychology and physical methods to work with the body, aimed to develop an understanding of our nature and liberation from suffering. Instructors of the school, being of different social, religious and political views, all agree with 3 principal aspects of morality, such as kindness, everyone’s personal freedom and responsibility. In our classes we are usually practicing mindfulness meditation, using the different techniques to develop awareness. Correct Approach to the Spine (CAS or #vajrayoga) is a complex method of physical exercises, specially developed for prophylaxis of spinal problems. This technique was created by professional Ukrainian chiropractor Yurij Glavchev and his disciple yogin Anatolij Pahomov – nowadays the head of the CAS International Federation, and it is based on a deep knowledge and understanding of biomechanics and many years of experience with the patients coming for chiropractic treatments from Hatha yoga classes and sports fields with different spinal injuries. After years of studying the cases of spinal injuries, a list of rules and instructions for any physical activities was designed in order to protect the spine and central nervous system and, therefore, all inner organs from damage, and in this way to preserve good health, or, in cases of already existing injuries, to facilitate the current state. 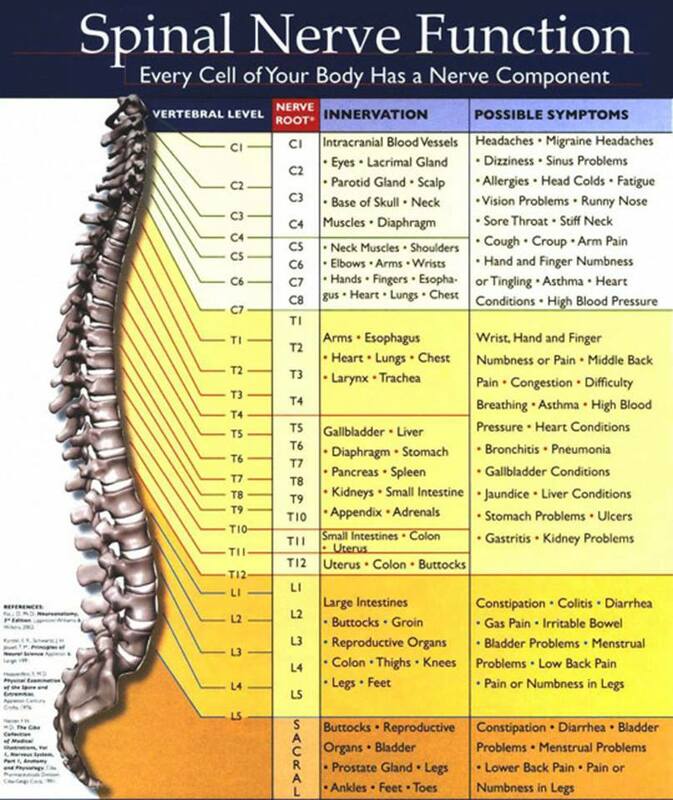 According to this, the first fact which CAS yoga is representing, is that the main duty of the spinal column – is to protect the central nervous system from possible injury. 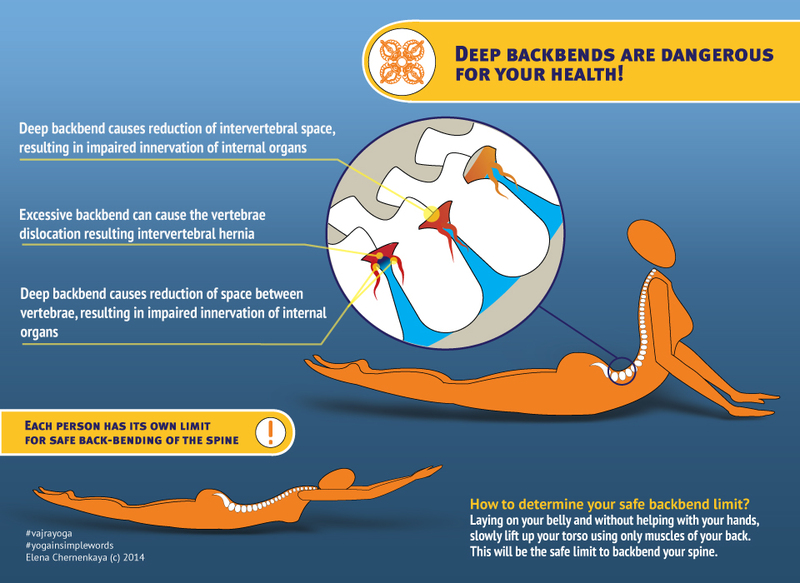 It means, the more stable our back is, the better it can carry out its main function. And this is the first contradiction with the most of modern yoga schools and sport/fitness techniques, which are working on increasing the flexibility of the spine. To keep the spine stable we are following “the golden rule of Correct Approach to the Spine” – in any activity we do, we keep shoulders and pelvis in a same or parallel planes. So, in this way we are fixing the spine between shoulders and pelvis and keeping it as much stable as possible. 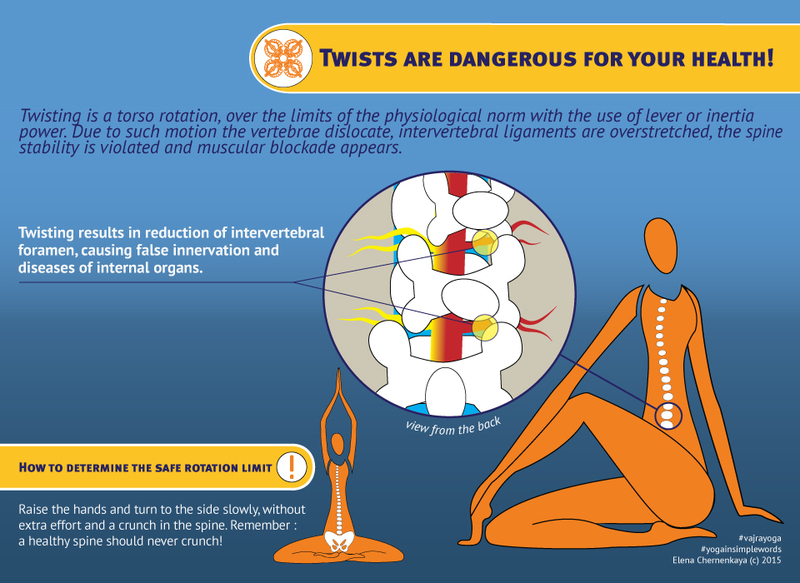 1.Twist is potentially dangerous for a spinal column stability because the vertebras are interconnected and fixed to each other at at least 6 points, which creates certain limits to the angle of rotation. So, we are able to turn our shoulders over the pelvis naturally, but using the levers to enforce this rotation while turning may have such a negative outcome as the displacement of the vertebrae. 2. 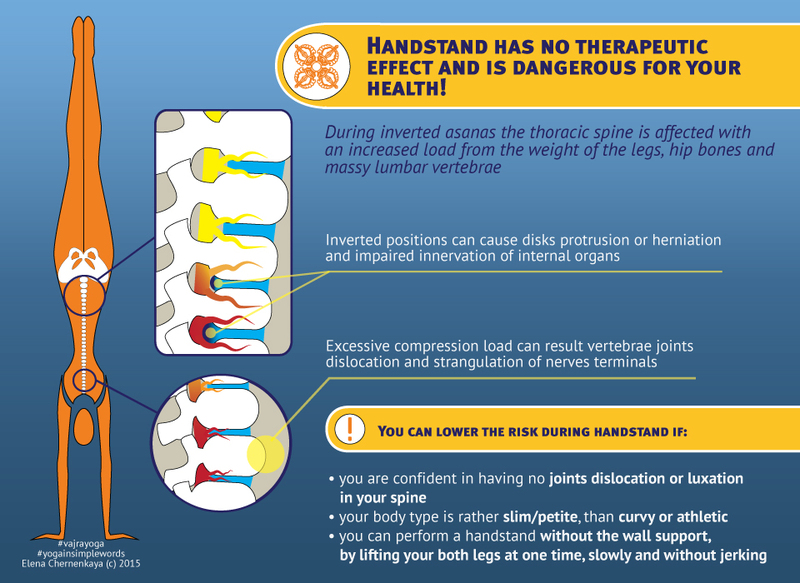 The side bends are particularly dangerous for those people who already have a vertebral displacement and practicing them can make the whole situation worse as it is decreasing the intervertebral space on one side and therefore can block the nerve roots, which are already hurting due to the injury. According the CAS yoga school the side bends are strictly prohibited in a group practice, because a group instructor is taking a complete responsibility of practitioners’ health in the group during the class. 3. The deep arch of the back contradicts the law of biomechanics, as it is not a natural movement for the spinal column. 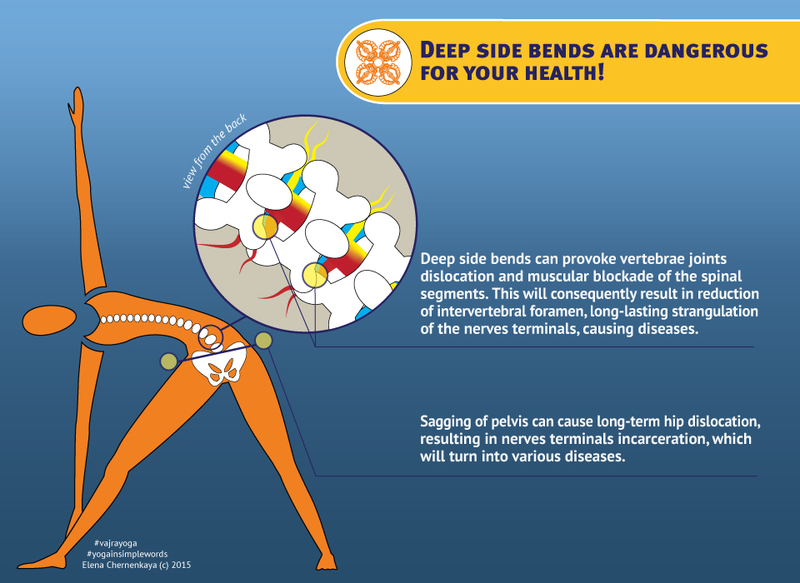 Similarly to the case of side bends, this motion is decreasing the intervertebral space and can cause the blockage of the nerve roots and vertebral displacement. 4. The upside downs postures such as head stand, shoulder stand and so on are activities potentially dangerous for the spinal column, thus can lead to serious back injuries, causing vertebral displacement. The anatomical structure of the back, with the massive vertebras of the low back and tiny neck vertebras, exists this way due to the different load they are supposed to carry. So, the massive vertebras at the low back are able to carry the weight of the whole torso, while the upper back and neck vertebras are much smaller in size as the weight they carry is not so heavy. So, when we go into upside down posture, all the massive weight of our legs, pelvis and torso is summed up all the way down and is loaded on the tiny upper back and neck vertebras, increasing the pressure on the chest area to the critical point. According to CAS Yoga practice this type of physical activity is strictly prohibited in a group practice as it can cause an irreversible health damage. The essence of the CAS Yoga practice we can describe in 3 words: strengthening, elongation, relaxation. In Vajra Yoga we only use local muscles, with no levers such as arms or legs or any auxiliary tools to “help” ourself to get deeper into a posture . The aim of the practice Yoga CAS – is to pump the blood and lymph through the body and softly stretch the muscles and elongate the spine in order to increase the intervertebral space and release the nervous roots, which might be blocked or pinched by the bones due to present vertebral displacement. In a fact we don’t need more than that to keep ourselves in a good health and to prevent the spinal problems, which cause about 90% of inner organs malfunction. We agree with the statement that the human health depends not on what person is doing, but mainly on what the person is avoiding to do in his daily life. The main practice of Yoga we recognize as dedication of the results of our practice towards wellness of all living beings.